Handmade Harbour: Fabrics and Craft Supplies Giveaway! Fabrics and Craft Supplies Giveaway! Oh wow...I'm getting so excited by all these giveaways this week! I'm hosting a different giveaway every day this week, Monday to Friday, so do pop back for more! Today, I'm pleased to be teaming up with Abakhan who are offering 3 vouchers, effectively tripling your chances of winning! Each voucher is for £20 and if you are one of the lucky winners you can spend your voucher on whatever you like from their website. it might be cold right now but I'm thinking summer picnics! Abakhan have long been one of my favourite fabric shops (I love that I'm close enough for a special trip every so often to their North Wales branch) but they don't just sell fabrics. There's a whole lot in the way of craft supplies too: if knitting, felting, crochet, beading or jewellery-making just happens to be your thing, you'll probably find something you love! Leave a comment on this post, telling me what you would make if you won. What are you waiting for? Pop over to Abakhan for a browse and some inspiration, and pop back here to leave your comment. Winners will be drawn Thursday 31st January at noon UK time and announced on this blog soon afterwards. This particular giveaway is only open to people in the UK. Check here for yesterday's giveaway if you missed it - and don't forget to pop back tomorrow for another! Isn't their spotty fleece fab?? I'd like to make a spotty fleeecy patchwork throw to snuggle under during this chilly weather. I love having a look around Abakhan. I want to have a go at making some summer tops (fingers crossed for sun). Thanks for the week of giveaways. I'm experimenting with paper and fabric patchwork on hand-made cards so the voucher would go on supplies. Abakahn is always inspiring to visit and I always spend too much! I want to make a snuggly comfy dog bed for ny gorgeous 4 month old miniature dachshund. I know exactly the shape and colours I want. Then I am going to make her a winter coat as all pet shop ready made ones are for little dogs with short backs! So I need something a little longer! Abakahn here I come !! This year I want to make my first quilt so I think I would start with some sections for that! Quilts and then some more quilts! It would have to be something relevant to the current very chilly weather for me: a gorgeous draft excluder, perhaps decorated with sequins for a bit of added glamour. If I won I think I might get some beads and make a necklace for me. I love their glass cross pendants. And they have some lovely buttons. 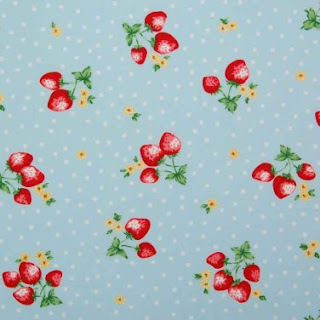 Hi if I won,I would love some of the fantastic strawberry material and I would make myself a lovely vintage style apron , I'm fed up with my practical boring apron ! As I am intending to follow the sew and knit along on ros made me this year I would spend it on buying supplies for this. That way I would have one less excuse to not join in! So glad to see an Abakhan voucher giveaway I can acutally enter ;-) If I won I would buy some of their lovely fleece to make microwave wheat cushions to keep us warm in these cold evenings. If there was enough I'd also make gloves and scarf for my son. I've seen some great colourful stripy and spotty cottons on their website. Those would be perfect for a new set of place mats for my dining table. If there's enough fabric left I would try to make a patchwork cushion cover to go on my rocking chair. Although very tempted by the knitting yarns, I would probably buy some of the felt and tools if I won. I love some of the felting I see online, and keep meaning to have a try at it myself. I would make a lovely quilted runner for my new bed. Thank you for the chance to win this giveaway. If I won I would use the voucher towards fabrics for my latest project, which is a quilt and accessories for my first grandchild (due this summer!). Hmmm - I think I would make a cushion for my sewing chair as it is rather wooden and hard after a few hours sewing!! Great giveaway!!! I would stock up on my jewellery making supplies, maybe some buttons for button jewellery!!! What a wonderful cheery fabric. This would look wonderful used in matching kitchen accessories, TPot cover, quilted placemats and matching curtains. I would make something out of the pink cow fabric for my sister's first baby due in June - unless it's a boy then I'd make us some new curtains! I would make some curtains for my youngest's bedroom, she has the ones I made for her big bro and keeps telling me she needs new pink ones!! Oohhhh the shower proof fabric looks good, I'm looking to make some totes and book bags so that would be ideal. Thanks for the chance to win this lovely prize. My daughter bought me a book for Christmas with patterns for 25 Animal Hats. Some of them are knitted, some crocheted and others are sewn from fleecy fabric. If I won I'd like to buy the wool to knit her a hat and also some fleece to make the cute fish hat for my 1 year old grandson. I'd be spoilt for choice in Abakhan though - I can get lost in their Manchester shop for hours! I love Abakhan and I can get to the Birkenhead one in 20 minutes! (which I do quite often!) I would enjoy buying some more expensive fabric and making a new cover for my recent charity shop chair purchase. I think it would be a patchwork cover! Wonderful week of giveaways Wendy! Thank you for a great giveaway. I would use the fabric to make lots of hexagons to make up into bags, also some fabric baskets. OOh what would I make...think it would be another quilt. I love that strawberry fabric, reminds me of a dress that I made my daughter 20odd years ago. I am working on a beedroom remake so i will buy fabric for it! Thanks for the chance to win. I'd fill a few holes in my yarn stash with some lovely summer yarn. The snow finally melted today and I'm looking forward to Spring! BUTTONS... you can NEVER have too many buttons. I could use them in so many projects - bags, cushions and more! I need to bring spring into my living room, so some nice bright cushion covers would be my priority. My friend is getting married in a few months and is really excited about button bouquets and handmade purses, so I would surprise her with a hamper of sundries for that. In her signature purple, of course! I really want to make a scrappy quilt, but don't have enough scraps. If I were lucky and won, I think I'd cheat by buying lots of skinny quarters of their quilting cottons. Oooh, this is well-timed! I have my eye on a fabric from their shop already, pink with tiny hearts and spots, for the backing of a baby quilt I'm working on! Thanks for the chance to win! I've just bought my first proper sewing pattern for a skirt, so Abakhan's wide selection of print cottons is looking very tempting!